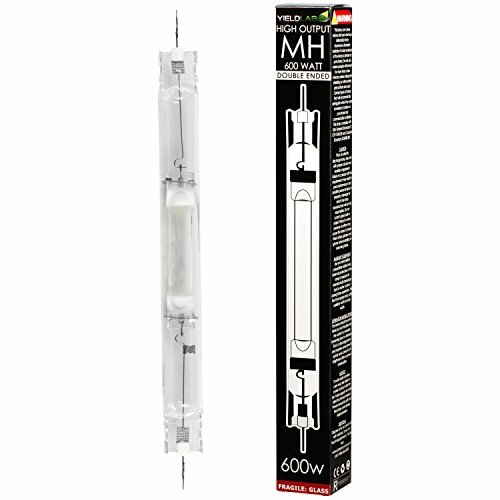 Double ended bulbs are known to be brighter and more efficient than standard HPS bulbs, and our Yield Lab Double Ended 600w HID Grow Light Bulbs don't disappoint. Unlike standard HPS bulbs, our double ended bulbs are powered from both ends for even firing and operation, givng these bulbs a longer lifespan than standard bulbs and a stronger output, too. The best part- double ended bulbs have more light output without more power than conventional bulbs. With a much higher and stronger orange spectrum output, your vegging growth will increase. If you're looking to grow bigger, stronger, and more efficiently you want a double ended bulb. For your double ended bulb needs, Yield Lab's got you covered. If you have any questions about this product by Yield Lab, contact us by completing and submitting the form below. If you are looking for a specif part number, please include it with your message.